Utah Division of Arts & Museums (UDAM) teaching artist. 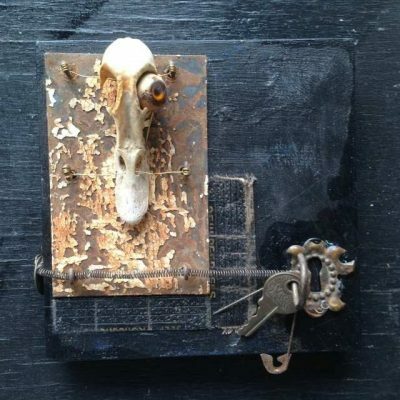 I have been creating my assemblage-collage style works since 1992. These I develop from a variety of materials: urban cast-offs, kitchen utensils, tin cans, or children’s doll parts; often more unusual, eclectic, or even collectible items such as old boxes, jewelry, old advertising and memorabilia. I have ten years experience working in the ceramic arts. My sculptures are constructed using conventional shop components, basic tools and traditional hardware; my work is crafted from low-fire raku clay. By combining, juxtaposing and redefining ordinary objects and cultural icons, I hope to initiate a visual conversation with the viewer.